The holidays make me a little crazy. When I see all those cute blog posts with 101 Christmas activities to do with your kids, I start biting my nails. And pinterest does nothing but fuel my anxiety that I might be missing prime teaching moments to introduce my kids to Christ. I completely forget that few bloggers post their mess-ups or craft flops, and even fewer photograph their children having Mach 5 meltdowns over the glitter and cotton balls. Even worse, I completely forget that leading my children toward Christ should happen every day of the year. Enter last week and my big mom fail. 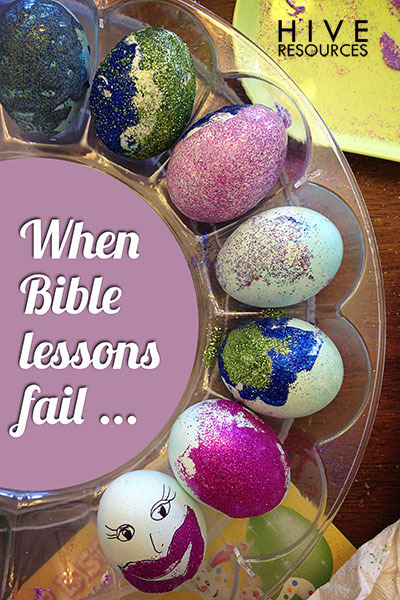 Armed with some hard boiled eggs, a gallon of glue, and glitter galore – I was prepped to plow through Easter like a Bible teacher on steroids. So, I should have seen it coming a mile way… my Bible lesson was almost a big a flop as my good intentions. Eggs? I didn’t make enough! Supplies? I didn’t confirm I had vinegar before dying our eggs! Have you tried dying your eggs without vinegar? Trust me, don’t. The color doesn’t take. Attitudes? I didn’t prep anyone’s hearts before running headlong into the activity. Imagine lots of grabbing, raised voices and colored dye going places I’d rather it not. Moms, everywhere. I’m here to tell you that it’s going to happen! Those perfectly planned crafts and object lessons designed to take advantage of holidays like Christmas and Easter are not going to go as planned every time! When I initiated my Bible lesson, my kids were in terrible moods. I should have observed they weren’t in the right mind or heart to absorb truth or be open to instruction. When things start to go south, take a break. Fortunately, our dyed eggs needed time to dry. But in reality, I needed time to put on the right heart, too. When we resumed our lesson later, everyone was ready to learn. 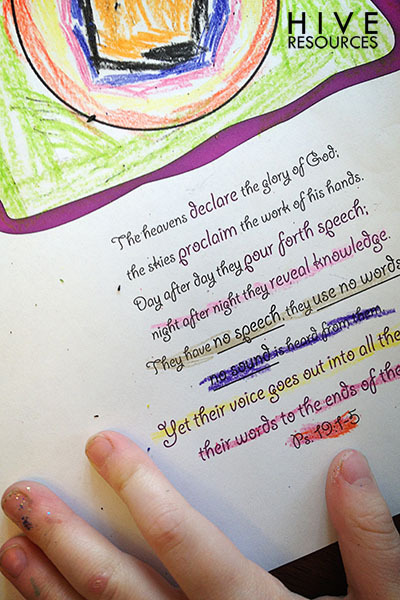 No kid will remember a theological treatise – but he will remember one simple truth. When I started my activity, I had planned to talk about New Life, but quickly had to simplify and choose a more concrete truth. I decided to pull from Ps. 19 instead and talk about how simple objects like eggs can speak of God’s glory. When none were found, we added our own with a little glitter and marker! I learned from Bible Teacher and Author Barbara Reaoch that children absorb Bible truths in layers. So, this week we will probably repeat this activity, adding in an additional truth as we go. The same truth repeated in new ways keeps God’s Word alive and fresh before their eyes. The most important thing I need to remember is that teaching moments happen best in everyday life every day of the year. If I’m careful to let my children see me trusting in God each day, then a few Bible craft fails won’t matter. Ps. 19 speaks to how creation reveals God’s glory – I can use this same lesson with summer flowers, with winter snowflakes, or with brightly-colored fall leaves. Keep up the good work moms! Easter is a wonderful time to intentionally introduce your child to the power of the cross in their daily life. 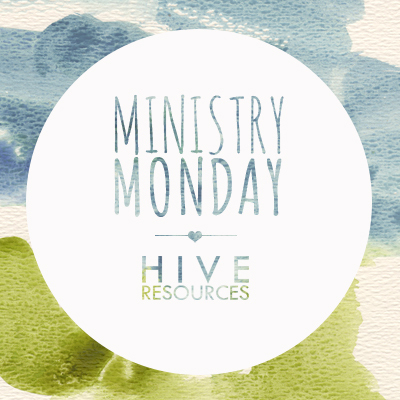 Just make sure you aren’t saving those special teaching moments for special days alone. Do you feel pressure to cram Bible truths into the week of a special holiday? Do you battle craft fails? What do you do to teach your child about Christ every day? Share your ideas in the comments! Thanks for sharing the reality! My kids usually reject my plan and come up with their own:) I like the idea of teaching in layers, so helpful. Melissa,such good bullet points.Our sermon yesterday was on Deuteronomy 6.You are resonating the same idea.We have been instructed to make the teachable moments about God as we go,not necessarily a sit-down carve out activity.Not that anything is wrong in doing that by itself but often time our OCD and finicky perfectness kills the spirit and joy of the activity that we are doing and very thing we are trying to communicate. Btw,i love those glittery eggs. It rely takes the pressure off when you see our job as a consistent walk rather than professional craft teacher! Great tips, Melissa! I like the idea of teaching in layers too. It makes these failed times seem more as preparing soil and planting seeds instead of looking for great fruit each time. PS – You’re a brave mom. 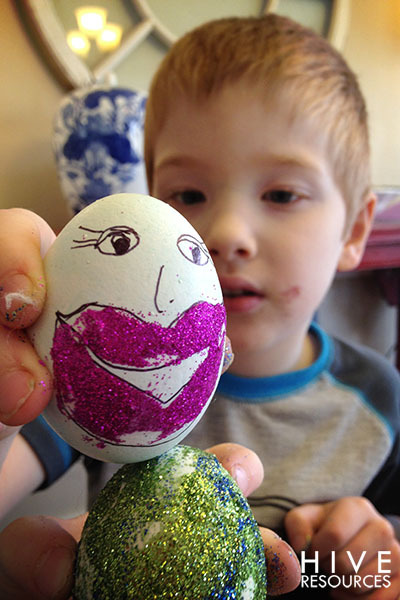 I had glitter but opted to avoid the mess when we colored our eggs. I’m learning more and more that I need to keep things simple-for myself as well as for my boys! I tend to get very frazzled very easily and also be a perfectionist, so when things don’t go “as planned” I start to feel as though things have failed, but really it’s just life with little boys!!!!! The fewer things I plan and the simpler I keep it, the more I feel we are ALL able to enjoy it. Thanks for the encouragement Melissa! Your husband found glitter all over the backyard, in one of his shoes, on his toothbrush, and on his pillowcase. What’s going on!?! ?